…the MTA is taking steps that will inhibit the line from serving the borough. The MTA divided the construction of the 2nd Avenue subway into four segments (phases) and commenced work on Phase I (63rd St. to 96th St.), which benefits the very wealthy Upper East Side. In the planned Phase II (96th St. to 125th St.), the agency has broken with all previous 2nd Avenue subway plans which proposed a station at 125th St. & 2nd Avenue with the line continuing north into the Bronx. In its current proposal, the MTA turns the line west on 125th St. with the station on an east-west axis to facilitate transfers from Metro North and the Lexington Avenue line. As far as the Bronx goes, the east-west station alignment creates a dead end. The 15 "Q" trains from the 63rd St. junction, projected to use the line, would never go to the Bronx. A 2nd Avenue subway going north from 125th St. could split in the Bronx and provide 2 new subway lines in that borough. With the "Q" line marooned in Manhattan, the remaining 2nd Avenue line would have the capacity for only one extension. A bellmouth at 125th St. & 2nd Avenue which the MTA does plan to provide would be totally dependent upon the completion of Phase III (Houston St.-63rd St.) and start of the proposed "T" train service. If Phase III is not built, the Bronx won’t have a new subway. It must be added that this westward extension is extremely expensive. The Phase II tunnels, built in the 1970's by the cut and cover method are shallow. The western extension, however, would have to go under the Lexington Avenue line, which has 2 levels. This means deep bore tunneling with a super expensive cavern station. All of this for a transfer! Wouldn’t going into the Bronx serve more people? Absolutely! Thus, why is the MTA wasting money on a transfer point? This alignment provides substantial evidence that the MTA has no intention to extend the new subway into the Bronx. The agency hopes that the transfer will add riders to the 2nd Avenue subway, which otherwise, would suffer from low ridership. This is a highly optimistic scenario since riders always prefer the quickest and most direct connection to their destination. They have no time for an additional cruise through the Upper East Side. Not content with making an Bronx extension of the 2nd Avenue subway more difficult, the MTA is taking steps to prevent the Bronx from using its best route: the Amtrak line. The Amtrak railroad line traverses the entire eastern part of the Bronx. The roadbed has room for 6 tracks with Amtrak using only two. Furthermore, the line crosses the Bronx in exactly the right areas: Hunt’s Point, Parkchester, the Municipal Hospital Complex and the huge Co-op City housing development. In terms of cost, extending the subway via the Amtrak would save a fortune: no tunneling (except at the tail end), no blasting, no digging, etc. It would be a matter of laying the ties, tracks, the 3rd rail, signals and building stations. The Regional Planning Association (RPA) proposed using a part of this route as did the MTA. In the 1970's, the MTA considered extending the 2nd Avenue subway into the Dyre Avenue line. Trains would have used the Amtrak route to 174th St. and then an elevated connection, remaining from the defunct New York, Westchester & Boston railroad, to the E. 180th St. (#2, #5) station. At the same time that the agency decided to turn the 2nd Avenue subway west at 125th St., it also decided to tear down the elevated connection at 174th St. This was done in 2003 ending the possibility of a connection to Dyre Avenue and sending a signal that the MTA no longer wanted to extend the 2nd Avenue subway into the Bronx. Since East Side Access will allow LIRR trains to go directly to Grand Central, space will open up at Penn Station. 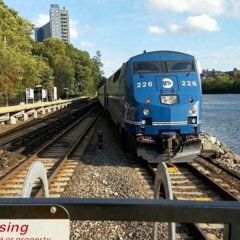 The MTA wants to run Metro North commuter trains from Connecticut on the same tracks as Amtrak to Penn Station. Since the roadbed has room for 6 tracks, this in itself would be no problem. The 2nd Avenue subway could use the other four tracks. Recently, however, the MTA has revived a 2006 proposal (Kappstatter) to build four Metro North stations directly on the Amtrak trackbed and thus, block its use for a 2nd Avenue subway extension! It would improve the commute for the 1% while preventing one for the 99%. Would the commuter train alone make a difference for the Bronx? Currently, the Metro North Harlem line runs directly through the center of the Bronx. The ride is prohibitively expensive and thus, few Bronx residents benefit. It has a few stations but aside from Fordham Road, they are so little used that most trains simply bypass them. No entrepreneurs established any significant companies along the route knowing that without a subway, the area would be unattractive to good employees. The same pattern would likely hold on the Amtrak. The proposed stations would not attract many riders and would mostly be bypassed. The only exception is the Bronx Municipal Complex where the station would be very useful for wealthier doctors and hospital administrators but not to hospital workers or the families of patients. What makes the MTA Metro North station proposal so galling is that the Amtrak line can accommodate both–amazingly, a project for the 100%--if the planning process is done right: The Metro North station at the Municipal Hospital complex should be built to accommodate both Metro North and 2nd Avenue trains. Parkchester and Hunt’s Point may not need Metro North stations at all if these two areas are served by the 2nd Avenue extension. At Co-op City the 2nd Avenue subway would leave the Amtrak and via a short tunnel enter the heart of Co-op City. A Metro North station built north of this point would not pose any conflict. If the stations are built on the trackbed, however, they will block the best and most inexpensive route for a Bronx 2nd Avenue subway. This action would force the extension to be dug elsewhere at enormous expense. Taken together with its plans for Phase II, it’s clear that the MTA doesn’t want the Bronx to have a new subway. I was under the impression that a station at 125 Street and 2 Avenue wasn't possible due to the water or impediment to future extension to the Bronx. I dont think they wanted to build a rather lengthy transfer (think the fabled PABT Times Sq transfer tunnel in length), but rather have passengers go right downstairs and find the tail end of a . Remember that 2Av is two blocks away from Lexington, not one. Lex to 3rd isn't as long as 3rd to 2nd, but its not like its a city block either. With a transfer tunnel that long, it wouldn't dent the Lex ridership coming out of the Bronx one bit. But yes, older plans just had a station at 125&2nd and on into the Bronx with no Manhattan terminus entirely. The SAS was always about the wealthy, anyway. According to the article, the tail end would be for the MetroNorth riders. The Lexington riders get the front end. I think at this point, it seems like it's going to take a minor miracle to get even Phase II built. We're probably at minimum 10 years from the line being open to 125th Street. I would imagine that it would probably about a decade or two beyond that before a line in the Bronx were even properly considered, much less funded and built. I think it's perfectly reasonable for the to end at Lexington so that customers can have a convenient transfer. Then decades down the line, if a new Bronx line is built, the can split off at 116th and continue northward. He's not talking about that, though. If the MTA built a station at 125th Street/2nd Avenue (which is not the plan), you'd have Lexington Avenue riders going through a long passageway between 2nd Avenue and Lexington Avenue and catch the back end of the . Under the current plan, yes the station would be at 125th Street/Lexington Avenue, and apparently it would be on the western side of Lexington Avenue, so riders from the on Lexington Avenue get the front end, and riders from the Metro-North on Park Avenue get the back end. It's a lot easier for the riders than having to go through a long passageway to reach 2nd Avenue. It would be cheaper to have the station end on the eastern side of Lexington Avenue, so that you don't have to tunnel under the , but then it would make it impossible to extend the line further across 125th Street because the are in the way. I guess they figure that if they're already sloping the line downward so it could get past the Lexington Avenue Line, they might as well make it easier for Metro-North riders as well. The Regional Planning Association actually recommended that the route go up 3rd Avenue, and then go across Fordham Road and go across to Inwood. This would actually help everybody that the 125th Street/Lexington Avenue transfer would (because now you connect with the at Jerome Avenue and the MNRR at Fordham Plaza, and now you have additional connections to the , , and (:o/(D)). If the bellmouth is built, I don't see how an extension across 125th Street would preclude the service to The Bronx: Just have the serve 125th Street and have the serve The Bronx). Just for the record, the RPA mentioned the 125th Street, 3rd Avenue/ Fordham Road, and Amtrak alignments, and listed out the pros and cons. lol... Some folks in here say that the Bronx has good subway coverage so I'm a bit confused... Which is it?? :confused: Then I hear that the subways in the Bronx always screw up, so I guess my question is if this extension did happen, would it really make subway service in the Bronx any better?? I looked this up while drawing my geographically accurate subway map. There actually are 3 big gaps in the Bronx where coverage is solely by bus. The official map will have you believe otherwise. VG8 taking a page from Mitt Romney lol. Hey lets also give VG8 a Mercedes as well lol. I'm just stating a simple fact... Aside from that those areas aren't densely populated either, so they don't need a subway. Areas like Throgs Neck, City Island, Country Club and Riverdale just do fine without a subway. This would replace the 3rd Avenue Elevated which ran in the Bronx until 1973. That part of the Bronx has to deal with long bus rides. Either a crosstown bus, or ride the Bx55 all the way down to the . Fordham Plaza has no direct subway service, a 6 block walk, the Bx12, or the Bx12 SBS is needed to get to the nearest subway stations on Fordham Road. The East Bronx also has long bus rides, the Throgs Neck PJs have a long ride during rush hours (up to 30 minutes, or even a bit more) from the Bx42 to Westchester Square during rush hours. Other parts of the Bronx (most of Soundview, Clason Point, most of Riverdale, Co Op City, etc) are bus dependent too. Riverdale does have the train, but that is only the eastern part. Then again Riverdale complains about train access, that is why the Bx20 remains during rush hours. I know some of you guys may disagree but it be decades if ever for a SAS extension into the Bronx. Thus why i believe they should light rail in portions of say 3rd or Webster Aves., East Tremont, as an alternative. Yes, and that's really on the beginning of the eastern portion of Riverdale. I'm on the western part of Riverdale by the Henry Hudson Parkway & 235th, so the express buses are easiest for me. MetroNorth can be a bit of a schlepp also with having to wait for the shuttle bus even though it stops right at my stop. Not only that but they need to fix the subway service that they currently have in the Bronx. As a original Brooklynite, I would be making a stink if I was still back in Brooklyn. I mean where is the relief at for South East Brooklyn? Yeah some areas of the Bronx have a schlepp on the bus, but at least they have buses. The areas of Brooklyn without subways can't even get decent local bus service. Overall the Bronx is well served transit wise, be it by subway, MetroNorth or the express bus. I think this might take the pressure off to build an actual subway. If light rail is in place, it won't improve transportation as much as a subway, nor integrate as well, and at the same time it will be used as an excuse to not build a subway for a long time to come. It's an all-or-nothing game. Southeastern Brooklyn is a bit more difficult to get subway service to. While the Bronx will have the opportunity to connect new branches to a brand new 2 Avenue line, Brooklyn only has 3 existing (and overcrowded) lines that can be extended to provide coverage (Nostrand Avenue, Eastern Parkway, and Canarsie). If there were a new Brooklyn trunk line (running through the Broadway station on the Crosstown line or via Atlantic Avenue) and a lot less NIMBYism, we'd have two of the prerequisite elements needed for a successful extension into southeastern Brooklyn. Yeah, The Bronx has good subway coverage, but it isn't perfect. As the RPA report says, there are two noticeable corridors that are in definite need of a subway line: The "Heights" corridor (High Bridge, Morris Heights, and University Heights), and the Central Bronx (the areas along 3rd Avenue). As far as making subway service better, it would definitely cut out the bus-subway deal for those areas, so it's one less thing to go wrong. The UES and UWS have subway lines and their crime rates are low. No, for the simple reason that they'd use it as an excuse not to build the real subway line. I'd rather wait "decades" for the subway to reach a neighborhood than to guarantee that the neighborhood would never see subway service. Call me an optimist, but that's my stance. Now, +SBS+ is fine for the area, as there's still hope that the neighborhood could get the subway in the future, but once you lay down train tracks, you're stuck with what you have. And the "schlep" from some areas of The Bronx can be just as annoying, if not moreso than from some neighborhoods in Brooklyn. Try riding the Bx40/42 out from the Throgs Neck area to the train. And the frequencies on those lines isn't too great, even when you combine them together (individually, they're like the B4). Checkmate by the time a Lex line say between 125th and Houston opens for service, if ever I be in a nursing home or no longer here on this planet lol. There so outerboros neighborhoods that would be a great choice for light rail. So Checkmate have you been on a light rail at all? Yes I agree ideally places like 3rd ave in bronx should have subway service. However I might be in nursing home or dead when that happens a long ago from now. I been on light rail across several cities in this country and also Toronto. It can work on a case-case basis in NYC IMO. Not every neighborhood can have access to a subway sadly due to variety of reasons mainly money. An expansion for the 2nd Avenue Subway to the Bx or Bk, I DON'T see for a very long time. The way finance is these days, not possible. Plus the MTA would have to go through the communities and see if things will work out. Those on 2nd Avenue are pissed off over the building of the Line, due to health concern and noise. But im sure they will ACCEPT it once its done. The 2nd Avenue Line via Hell Gate/NEC Line, isn't a bad idea, but then the line maybe be subjected to FRA. That line is owned by Amtrak, so the MTA can't just go and do what it wants. Plus the media has to remember that there is Fright service on that line sometimes, which use the un-electrified tracks, coming out of Oak Point Yard and Hunts Point, the Bronx. TBH, the MTA shouldn't worry much about the Bronx, as we can handle it. Maybe Metro-North service along the NEC will do. I would prefer also seeing the extension of the NJT HBLR into SI, rather then making the S89 a Select Bus..
We do have service, even tho there ARE spots in the Bronx under served and replaced by Bus Service. -Going Crosstown in the Bronx requires Bus Service or and/or Bx12+Select. It is cheaper than a subway. There a reason almost every big city/region in America in recent years has bulit light rail. And there no way many NYC residents want to be taxed in this recession to build the subway lines. Not to mention the NIMBY's as well. All i am saying on a case-case basis light rail can work in nyc. Remember trolley cars 100 years ago was all over the 5 boros. I've been on the HBLR a few times. In any case, light rail is better than nothing, but the point is that you are guaranteed that the neighborhood will get nothing better than light rail, because everybody will use the light rail as an excuse not to put heavy rail down. For instance, I oppose light rail on the North Shore of SI. Why? It may work for the next 20 or 30 years, but what happens when the population increases and the line can no longer handle it? And what happens if/when there is enough political pressure to connect the SIR with the rest of the subway system? And then the light rail system can't take advantage of the new connection. It's the same idea in The Bronx. You have a light rail, but everything else is heavy rail, so the neighborhoods along the line are still faced with the problems of having to make an extra transfer to reach Manhattan because it's impossible to integrate the line with the rest of the system. Do I oppose light rail in every single case? No, the West Shore of SI would work well with light rail because it could be integrated with the HBLR. A light rail line along the Belt Parkway and Van Wyck Expressway would be great and would help immensly (it could be integrated with the AirTrain). And there are probably a bunch of other corridors I'm leaving out. Yeah, it should be done on a case-by-case basis, but there is a difference between "Light rail is perfect for this corridor" and "Let's put it down because it's cheaper than a subway". So in those cases where the area needs a subway but there isn't enough funding for it, the only solution is BRT. Give it every single advantage you would give to a light rail line (put down bus lanes and enforce them, give them TSP at every single intersection, off-board payment of course, etc) and then when you get the money, build the subway ASAP. Exactly, in the long term, the subway line is cheaper. You save on labor costs (you get a T/O and conductor and you can move 2,000 people, whereas a light rail car can't move more than a few hundred). 1) "Right by light rail line that's only one transfer away from Manhattan and has to deal with surface traffic just like the bus line it replaced"
2) "Right by subway line that goes directly to Manhattan on its dedicated ROW"
Obviously they wouldn't use those exact terms, but a subway line is definitely more appealing than a light rail line. I hate to point it out, but I don't think you get it. A light rail is light rail only if it has it's own ROW. HBLR is a light rail because it has it's own ROW. If it doesn't that it would be a streetcar, and the HBLR isn't a streetcar. HBLR still shares some of the ROW with freight lines, if im correct. Within Bayonne. Same for Newark Light rail sharing Norfolk tracks. But you do have it right. SEPTAs Trolly Lines are not even a Light Rail Line, just Street cars which has little of its own ROW, and the Subway. Unless it's within walking distance then it isn't exactly subway service IMO and the areas that I mentioned fall into those lines. Who cares? I wasn't talking about Manhattan. I'm talking specifically about the Bronx, but thank you for bringing that point up yet again. Yes, I know that... And yes, NIMBYism would be an issue. Riverdalians are very protective over their neighborhoods and certain parts of Riverdale have been protected from overbuilding for fear of destroying the neighborhood, so yes the majority of us would fight like hell. What we have is sufficient enough... MetroNorth and our express buses are quick modes of transportation. If folks live in Riverdale and can afford the neighborhood and can't afford the quick modes of transportation and b*tch and moan about the schlepp on the subway well then they were foolish to move to Riverdale, so it is what it is. Yes, but they're not really high-density here in New York City, which is what matters here. Building a subway in some areas would be foolish because it would get light use if that. You know what they say when you assume... I don't care about those damn extensions... I was referring to other parts of South East Brooklyn, thank you. I know what, but thank you again for adding to something I already know. No need to discuss this further. You act like I'm some sort of foreigner to New York City or something. He doesn't get a lot of things... He just likes to repeat himself over and over... How many times is he going to repeat that subways in the long run are cheaper?